Last week I visited Lighthouse Park in West Vancouver to photograph a potential sunset from Juniper Point. My plan for the day had been to hike and photograph in Lynn Headwaters Regional Park as the forecast was for a cloudy (but dry) day that would be perfect for exploring forest and river photo opportunities. As it turned out the day was mostly sunny with just a few clouds. After 10km of hiking and only a few photo I decided to switch gears and spend the evening at Lighthouse Park to explore some of the trails I hadn’t previously walked. Juniper Point seemed like a great place to start. Upon arriving at Juniper Point I found the opposite issue to what I’d seen in Lynn Headwaters – too many clouds. This is great for even light on waterfalls, rivers, and plants in the forest but not often conducive to ocean/sunset photography. I’ve learned to be happy with just getting the layout of an area on first visits, so not coming home with some good photos was going to be just fine. There were a lot of rock climbers at Juniper Point so I sat down and watched them for a while, and photographed the occasional boat passing on the water. 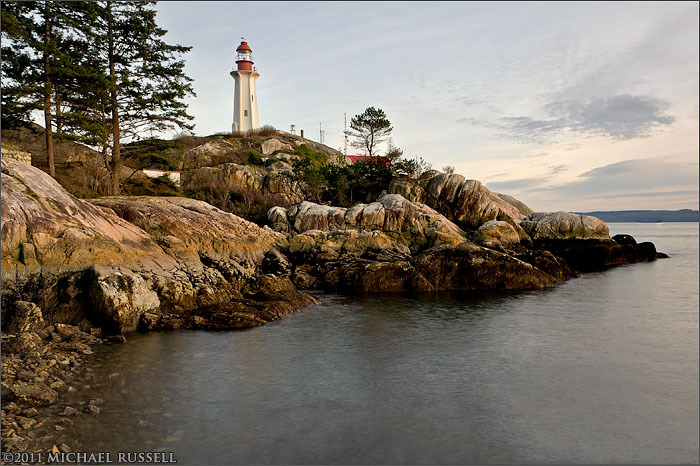 It was nice to be sitting outside in the evening at Lighthouse Park and still be able to feel my fingers! As sunset was still well over an hour away, I had almost decided to wander a few more trails when I started talking to a local photographer Jason Darr instead. I am glad I did for a number of reasons but this also kept me at Juniper Point until the light became very worthwhile. As you can see from the first photograph above, the relatively grey skies gave way to a pretty decent sunset in one area of the sky over one of the Grebe Islets, Bowen Island and the mountain peaks in the Sunshine Coast’s Tetrahedron Range. The main photography “star” of this spot is this one tree that hangs over the cliffs. While the area is called Juniper Point, this tree appears to be either a stunted Douglas Fir (Pseudotsuga menziesii) or perhaps a Grand Fir (Abies grandis) both of which are native to the park. The large cones on this specimen eliminate the possibility of this being one of the other tree species in the area from what I can tell. I am not always in biology mode when photographing, so as usual I came home without all the right evidence for a proper identification. While I may still occasionally ignore the lesson to stay at a location until the light is entirely gone, the above photo illustrates the potential benefits of waiting. Even without the colourful light there were many great textures and patterns in the clouds above the sunset, but for just a few minutes they lit up too, though in a more subtle manner. 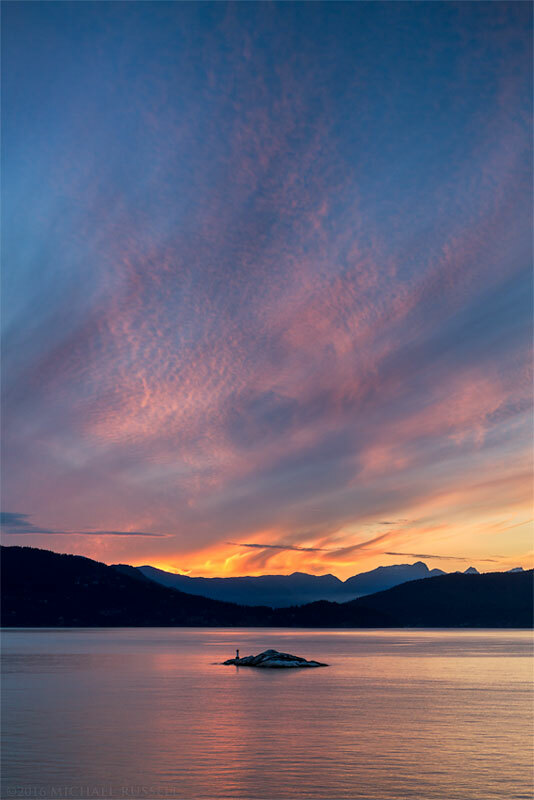 I used one of Howe Sound’s Grebe Islets as a foreground element which lined up nicely with the sunset over the Tetrahedron Range, as well as those textured clouds higher in the sky. 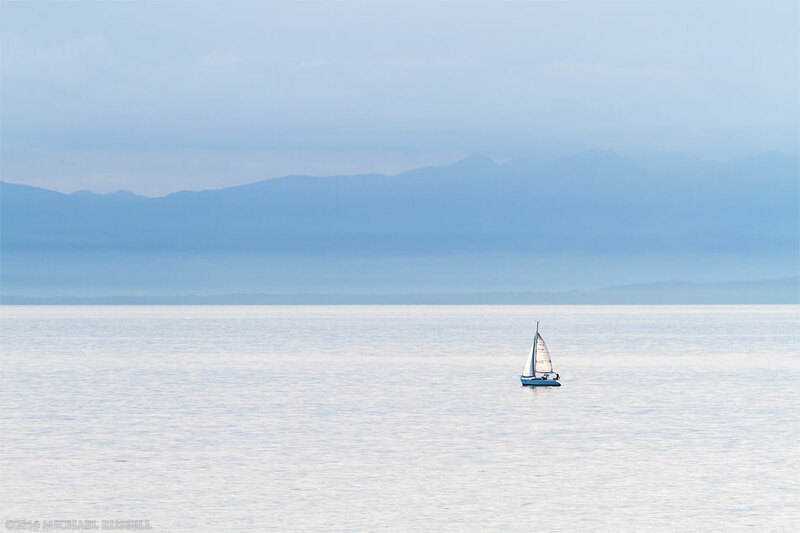 I prefer to do minimal post processing work on my images, so my 2 stop graduated neutral density filter had a lot of use in the various compositions I made with this particular scene. One does not need vivid sunset light to make interesting photographs, though it certainly helps. 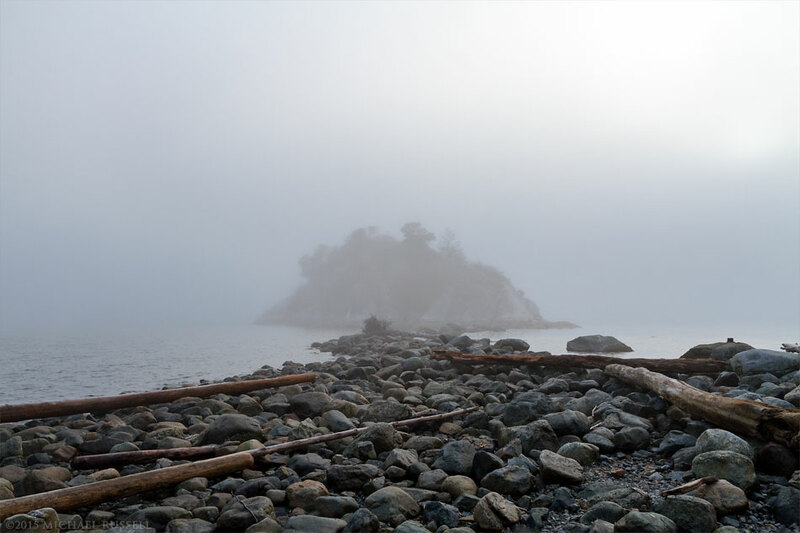 When I first arrived at Lighthouse Park I found fairly harsh light showing through the clouds, with poor visibility in the distance (towards the south and Vancouver to the south east). This worked well for the photograph below of a small Hunter 280 Sailboat heading through the Salish Sea towards Vancouver. 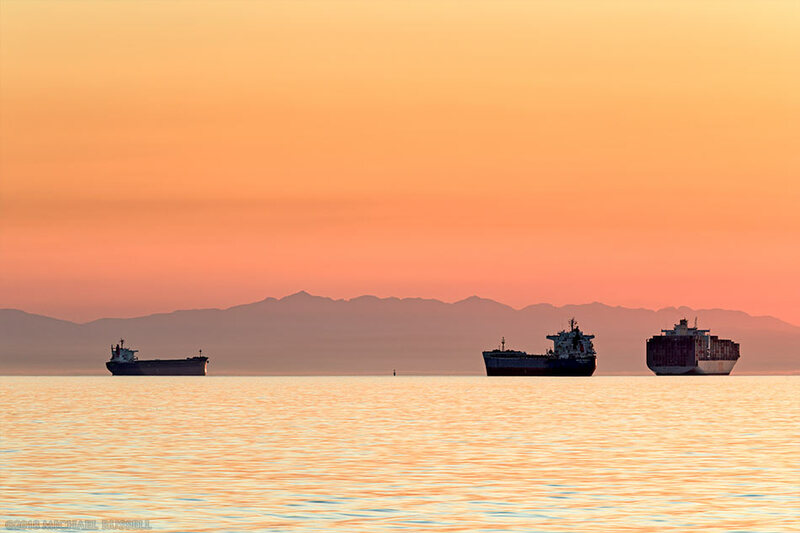 The mountains in the background are located on Vancouver Island – most likely near Ladysmith. For more photographs made in West Vancouver visit my Vancouver Coast & Mountains Gallery. 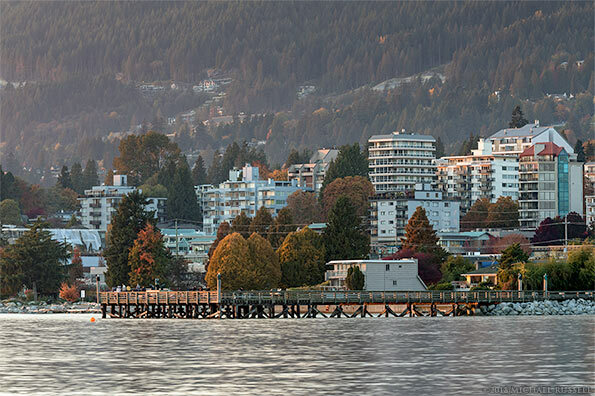 Good weather and sunny days can be hard to find on occasion in Southwest British Columbia during the fall so last week I headed to Horseshoe Bay in West Vancouver. 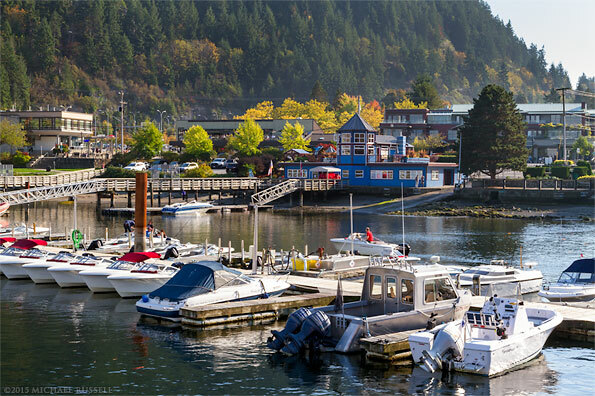 I had never before visited Horseshoe Bay except to board a ferry to Vancouver Island, so a sunny day seemed like a good opportunity. 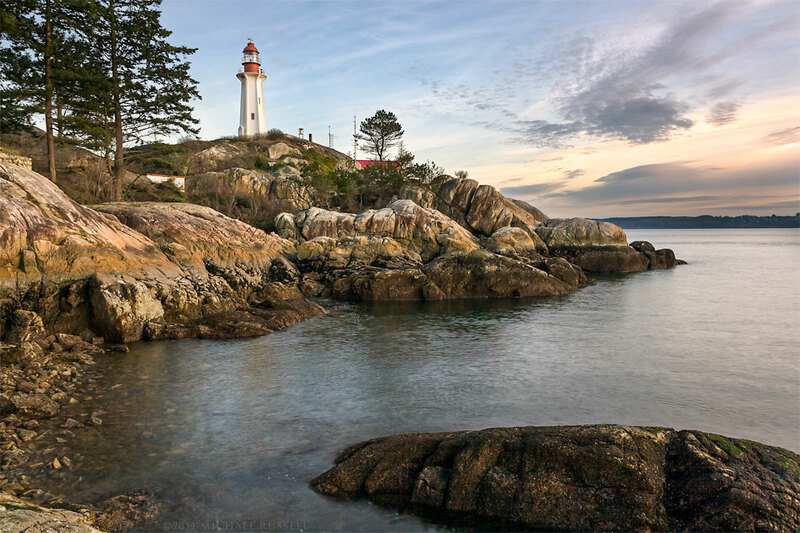 My initial plan was to stop at Lighthouse Park, Whytecliff Park and then Horseshoe Bay and enjoy the waterfront view along Marine Drive. However, a fog bank hung just offshore which made it clear visiting Lighthouse Park would be an exercise in disorientation. 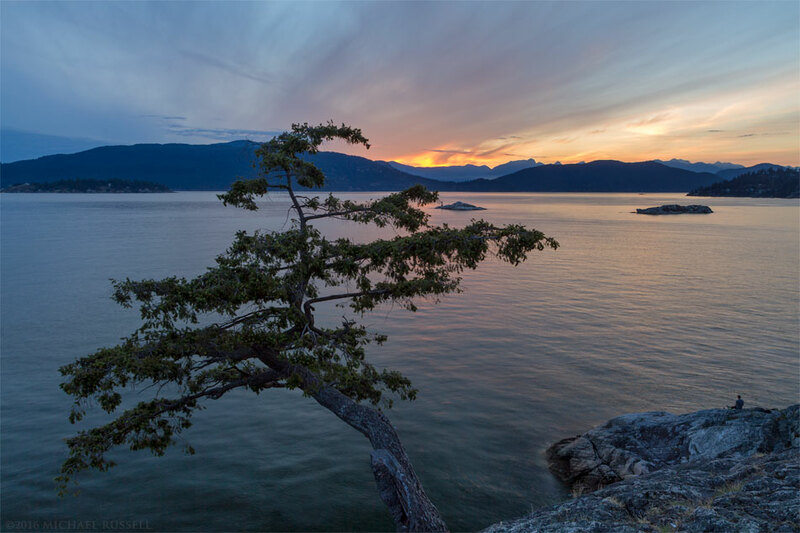 I was happy to find that Horseshoe Bay had no fog, with just a small amount visible off in the distance in Howe Sound. After parking at Horseshoe Bay Park I walked down to the beach and onto the Horseshoe Bay Public Dock. From there I photographed the panorama above showing some of the shoreline in the park as well as the Lookout Coffee Shop (Blue building) at Sewell’s Marina. I had heard of Sewell’s Marina before, if only because it was into these boats and docks that the Queen of Oak Bay had “hard landed” back in 2005. The video of that incident is interesting, and nobody was injured. It does appear many of the boats at the marina were not that lucky. 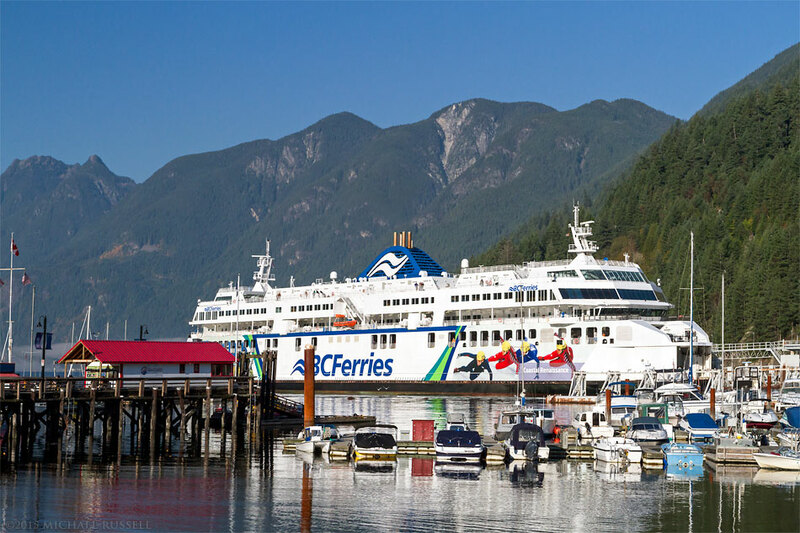 The BC Ferries vessel pictured below is the MV Coastal Renaissance – one of the newer Coastal Class ferries making the run from Horseshoe Bay to Departure Bay (Nanaimo) or from Tsawwassen to Swartz Bay (Victoria). I photographed the MV Coastal Renaissance on this occasion as it approached the ferry terminal to dock. I didn’t consult the ferry schedule before my trip but was lucky to photograph both the MV Coastal Renaissance (arriving) and the older Queen of Surrey (departing) while at Horseshoe Bay. 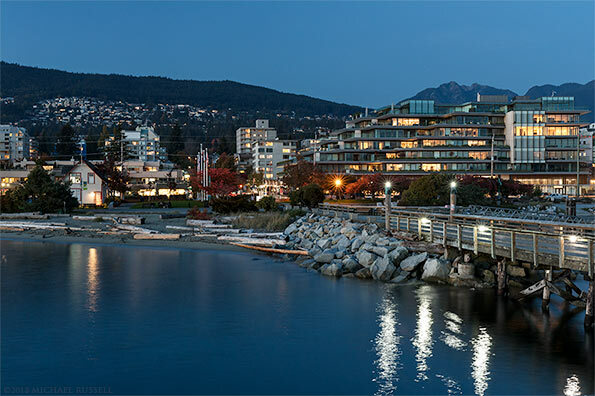 I had the impression that there was more to Horseshoe Bay than what I found, but it was a very nice spot to stop and photograph. If I were the sort eat lunch at a restaurant after hiking nearby this would be a good spot to do it. I tend to have a thermos of soup or a sandwich in the cooler instead though. The most (maybe only) interesting building along the shore is the Lookout Coffee Shop. The rest of the buildings there are rather generic – the great scenery here is the winning feature, not the architecture. 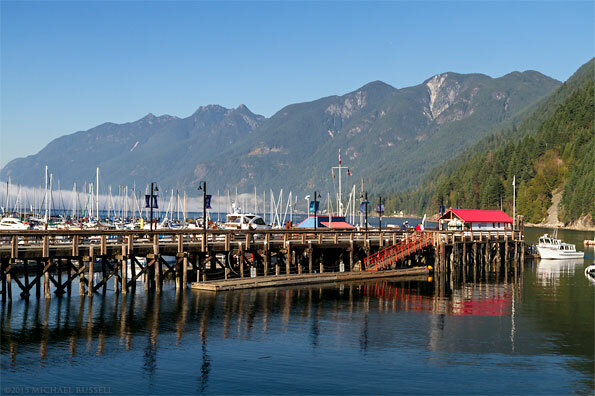 This is the Horseshoe Bay Public Dock which offers a good view of most of the sights in Horseshoe Bay. From here you can look at the ferries, the boats in the marina, and north towards Howe Sound and the mountain ranges further up the Sea to Sky highway.